Great suggestions. I would be interested in hearing what anyone else who uses mmd citation style thinks. For me, the 48[ approach would be the most streamlined, even if not the most intuitive, since it doesn't require having to move (or even touch) the cursor after inserting the citation---the cursor would move automatically to the end of the citekey after insertion and you're on your way. Of course, I can understand how others, and new users, might be thrown off by any alterations to the behavior of the current citation mechanism. Any thoughts from other mmd-citation users? Also: Is there a reason why pandoc style citation does not automatically include the parentheses in the inserted citation? Do you type out your page reference in parentheses (ie (48)) before invoking ZK: Insert Citation? In pandoc @citekey just cites the source, which is often exactly what I need, i.e. no page number needed (e.g. when citing papers). for your approach and development. and many other utilities added great value. I am new to sublime text and I wonder is there any way that fuzzysearch ctrl shift f display titles in sidebar at the some time I input first characters and after opening in sidebar I can key title which opens article with added color of word search. I already found goto anything and pluggins find in project. Your tag search is doing this with the tags. bring up the command palette by pressing [cmd]+[shift]+[p] on macOS ([ctrl]+[shift]+[p] on Windows and Linux). type zk to list the Zettelkasten commands. The Zettelkasten Mode allows for easy mouse navigation through your note archive. Note: If you have upgraded this package and entered the Zettelkasten Mode for the first time, SublimeText may be confused about the syntax of your notes. In that case, open a note and use the menu: 'View' -> 'Syntax' -> 'Open all with current extension as...', and select 'sublime_zk > Markdown Zettelkasten'. The Zettelkasten mode introduces a saved searches file. This is a simple Text file where you can name and store search terms. The search-spec will be highlighted in the file, so you know exactly what will be searched for. In the animation below, the mouse was used. "ctrl shift alt f" add fuzzy search for words in all articles. I detest the other way 'round, like [#foo] I don't know why. Both are valid syntax, though. MMD will link to a reference item as a whole when you use [#citekey] or [#citekey]1; If you want to add an entry to the list of references without placing a footnote/citation anywhere, there also is the special string [Not Cited][#citekey], by the way. MMD will link to a reference item as a whole when you use [#citekey] or [#citekey][^fn1]; If you want to add an entry to the list of references without placing a footnote/citation anywhere, there also is the special string [Not Cited][#citekey], by the way. Thank you @ctietze , your MMD affection, expertise, and practice are really valuable here. Good call, @ctietze, in distinguishing between single- and multi-page citations. I tend to cite single pages or page ranges, such as [48-51], so I neglected to consider more complicated possibilities. So, I agree with you both that the "move the cursor afterwards" option (if we want to call it that) could certainly work. 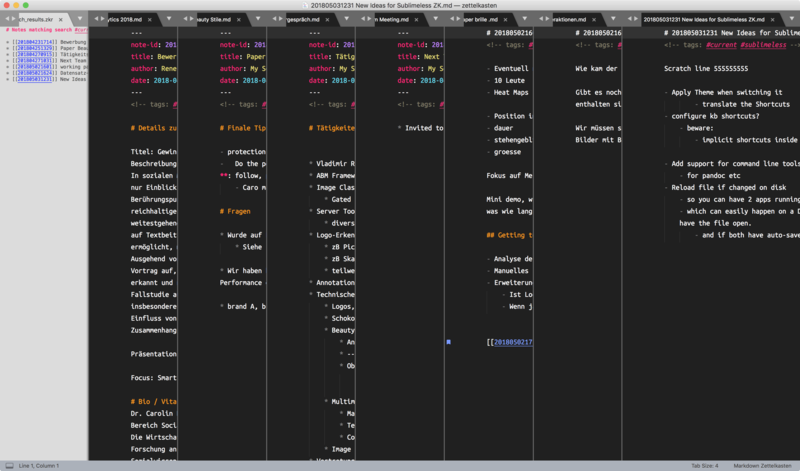 I am currently using the View All Notes window as a sidebar navigation tool (after hiding Sublime's default sidebar). How to open additional notes as single detached panes? setting pane to -1 or 0 won't do. I already have three panes in use so I need some extra. Can anyone come up with a better name for Sublimeless_ZK? As Sublimeless_ZK is maturing, I think it can do with a better, maybe more descriptive (as in, possibly, Markdown Zettelkasten) name. New users might not get the whole SublimeMore/Less business. Does anyone have a good idea? Do you need incentives? Does anyone have a good idea for an incentive? What about being prominently named in the about dialog: "Named by ..."
Maybe, if the name is cool enough, the then-not-sublimeless_zk-anymore might even make it into the tools section --- that would be awesome! oh shoot! wrong thread sorry! The feature 'ZK:Auto Bib' is not working at the moment. I maintain the bib file in my ZK folder. The message I get in the SB console is this: "using local /Users/.../Zettelkasten/Bibliography.bib" and at the end of the note there is the comment with the cite key and "no bib generated"
Do you have pandoc installed? Now we're getting somewhere. It is probably the worst timing ever but this is what's often bugging me with, probably most of the time well-meant "bug reports", that unwantedly come across a bit rude. If you just said "Autobib doesn't work", there's not a lot I could do other than check if it works for me, which it does. The more specific you get, the easier it is for me or anyone else who might have had a similar problem, to help you. Worse, as an example, if someone only says "X doesn't work", and implicitly or explicitly asks to get it fixed, in my head this often translates to "Yo, fix my problem!". At which stage my mind automatically starts to reason that here someone demands his problem to be fixed, knowing that it can't be fixed, because the problem isn't even stated clearly. "Doesn't work" can mean a lot of things, even in this context (crash (what's a crash? ), no autobib generated, a bib generated like you describe now (with error message "no bib generated"), ...). With no clear description of the error, all I can do is try myself, on my system, with my version of the plugin, with my bib file, with my selection of cite-keys, and come to the conclusion that it works. Automatically then, if I'm in the right mood, the back of my head starts formulating a response like this: "You demand your problem to be solved but don't provide any details. Look, this is free software. I am doing this in my very spare spare time. I prefer to spend my spare time on things that are important (to me), and ideally: fun. . If you want to make demands, please get yourself some commercial software. Its authors will (hopefully) go out of their ways and spend all the time necessary to pull every bit of information needed to fix your problem from you. People are willing to help, in general. With no further information, they just can't. Please provide more details..."
So, I don't accuse you of having been impolite or even rude. But your issue is a case where we just need more details (the pandoc version number is a start) or else there's no hope to get your issue resolved. Back to your issue: It seems like either pandoc doesn't like your bib file or that specific entry, or the plugin cannot parse the output from pandoc in this case. Given that people with enormous bib files use the plugin, I am really curious what's so special about yours. With that information, it should be easy enough for anyone to reproduce your problem, which is the first step to coming up with a fix or workaround by a fellow user. I hope I haven't hurt any feelings, I really don't mean to. Let me start with your last sentence, and hopefully I will be short in my response and to the point. You have not hurt my feelings in any way, but I feel that I have hurt yours based on your detailed explanation. The situation that led you to feel this way can be explained as follows. I have very little knowledge of the technology, and I have been using your professional tools like Sublime_ZK for a few weeks only, with success for the most part. The reason that I was not able to be specific enough about the Auto-Bib is because I have never used pandoc before, so I cannot troubleshoot it correctly. I only use extension .md and pandoc within SB_ZK because of the features, not for output. And I may even later switch to .txt or tex if I can without losing any benefit. When you created SB_ZK you assumed users would have enough background to use the software right off the bat. But I'm a newbie, and newbies can be confused with people who have knowledge but are sloppy and lazy, and want to take advantage of your precious time. So this is the reason my post came off "across a bit rude," as in "yo, fix my problem!" Please know that this is not the case here. I don't know if you recognize me from other posts, but I always thank you and appreciate your willingness to help and improve the app. So I should say sorry that my ignorance caused you to profile me as you did. Sometimes I simply cannot give further details because I don't understand the technology well enough. Also, I cannot get myself another software because there is no other app like it for me. I hope I have provided a clearer perspective. Back to the issue. In terminal I receive the echo ok. Problem must be in my SB settings. This is not an urgent matter for me, but I in this case I will also try to find solutions outside the forum given that some of my problems are too basic for the benefit of other more seasoned users. @Nhaps Thanks for your kind response. I am glad I didn't. And you haven't either. Everything's fine on my end. We all have our moments, haven't we? The length of my response just ... happened. I cannot and do not want to blame you for not being a seasoned pandoc user. That would be unfair. The idea was that the plugin only needs pandoc installed to be able to call it in order to create bibliography entries (so I don't have to write code that does that). A user should not have to worry about how that works. What I wanted to point out was that I need more information about your bib file so I can see what pandoc is doing with it -> what the plugin is doing with pandoc's output -> what's going wrong -> fix it. As for .md vs .txt, I think that's your personal preference and either is fine. There is a strong case for using Markdown mark-up, though. I would argue that it gets less in your way than LaTeX. 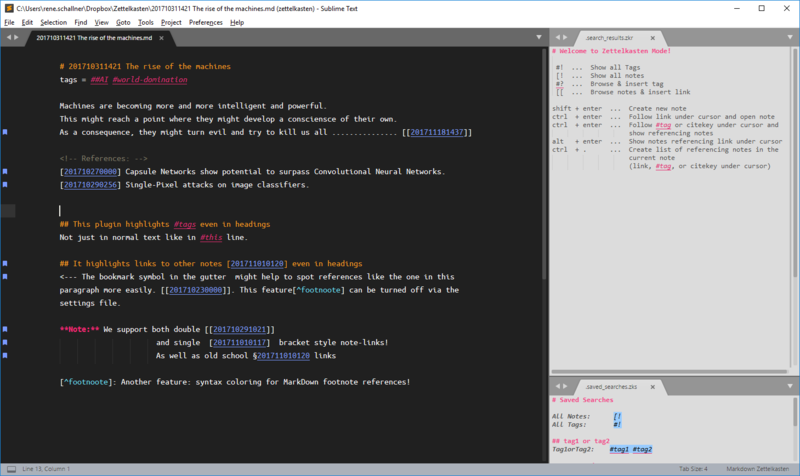 Hence, most tools you see here are based on the concept of notes formatted in Markdown. I use markdown to produce, via pandoc and intermediate LaTeX, really cool PDFs from beautiful reports to scientific papers. Sometimes I keep and tweak the LaTeX (e.g. for table and figure tuning), but that's only at the last stages before submitting / publishing. Based on my experience with that, I would never start with LaTeX from scratch now, except if I needed super-sophisticated formatting of my text that Markdown just has no mark-up for, and where embedding LaTeX is not sufficient. Yes, you're right there, and it's somehow in the nature of the plugin. SublimeText is not an easy editor, especially with all its plugins, JSON files for settings, etc. So by creating a plugin, I assumed that someone who is using SublimeText already, probably has enough experience to deal with my little plugin. As the plugin grew, that assumption got less and less valid. I get that. Yeah, back to the issue. Since you describe you get the echo OK, I doubt settings are the problem here. Can you please, please, please post (or send to me via message, this board has a send message facility) the output you get? I think this needs to be fixed in the plugin. That is: One line for the citation, a blank line, a longer bibliography entry spanning multiple lines, two empty lines. (I have included the shell prompt rs$ and the cursor _, just for illustration). So, if there is no blank line separating the two outputs, for instance, the plugin doesn't recognize pandoc's output. It expects that empty line to be there. But maybe there's another reason that confuses the code, so please, if you can just post / send the output from your terminal like I just did, that should help me get a better understanding. Thanks for the long post, always helpful. The concrete example was superb, now I have it working! It is best to use Terminal (or iTerm) to troubleshoot things, SB error messages are not accurate enough. Echo in Terminal picked up all the errors in my bib file. Basically they were some German umlaut, and other fields that were empty. From the line number in Terminal I used the Goto, Goto Line in Sublime to quickly locate the errors. Thanks very much for your patience, @rene! Awesome! Great you got it to work! I disabled printing of pandoc error messages to the ST console. Didn't want to spam it... Maybe that was a bad decision. Thanks. Yes, for me it would be useful to have all errors displayed in SB but that's not a must as I can use terminal for troubleshooting. As an aside, I use BibLaTeX which is not compatible, or simple to use with Pandoc. @Rene, I have noticed a bug: Auto-Bib does not work well with folded text in ST, it will mess up your running text. The temporary solution is to expand all folded text for Auto-Bib to work. Let us know if you can reproduce the bug. @rene ... Hi - I‘m just in progress of testing/migrating from zkn to sublime. However: is it possible to have lumannˋs ID-Style? I know the question is somewhat religious but I have a few reasons why I need his numbering scheme? I don't ever keep text folded. AFAIK Auto-Bib replaces the entire text with new text that consists o the old text with the (replaced) BIB appended. Mayyybe (well, probably) there is a better way to do that, that doesn't mess with folded text. I what way does it mess up the running text? I would suppose it just unfolds it (since ST treats it as new text)? It doesn't cut off paragraphs or shuffles your lines or sth serious, does it? Hi @oal100 hmmm. That plugin is super-non-flexible when it comes to IDs. While some of the stuff would work with generic IDs or even just [[links with just text]], the numeric note ID scheme is relatively deeply ingrained into the plugin. It also has the advantage of being relatively unambiguous, as potentially opposed to 1/1a/2b... On top of that, having the file names contain the IDs is a big plus. With Luhmann style IDs they would get cumbersome to deal with on the shell, for some other tools, as '/' also serves as directory separator. So, mayyybe it could be done, but there is no quick fix for the plugin I fear. Maybe you will find some workaround...? Like using numeric IDs for (new) links but naming the notes with Luhmann IDs ...? Something in that direction. @rene Thanks for your answer. I’d have no issues if the timestamps are used internally and not visible - because I think this is a great concept. As for the IDs I should be able to generate files and filenames „1a22b Topic.md“, the topic be #1a22b Topic and the link be [[1a22b Topic]]... no „/„ needed. Would that be possible? No text gets lost, but at first text folds in wrong location. Upon folding and expanding again with the mouse it corrects itself.